As the ratings for televised motorcycle racing continue to go through the roof in North America, I find myself more frightened than happy at the ever-increasing popularity of two-wheeled conveyances. Indulge me for moment with your imaginations. Envision, if you will, a U.S.A. where the names Rossi, Gibernau, Mladin, and Bostrom are as commonly known and objectified as the names Earnhardt and Waltrip. Conjure up your own vivid mental images of big-name companies like Budweiser and Wal-Mart with their logos emblazoned upon the fiberglass bodywork factory superbikes. Imagine a Sunday at Fontana when 150,000-plus screaming motofans pack the bleachers in support of the AMA roadracing series. It's a wonderful picture, isn't it? Actually, no. It's not wonderful at all. To help me illustrate my opinion, please indulge me again. But this time, envision a world where decent seats at a superbike race cost $200 per head. Imagine not being granted paddock access without a pricey-yet-restrictive press pass. Think about the effects of superbike mass-commercialization on a generation of young people that is already doing its best to stunt and street race itself into the grave. Consider how the empty-headed legislators of American government will react in the wake of such a series of events. Last, but certainly not least, envision a premier American motorcycle roadracing series where privateers are either unwelcome or excluded altogether. Those things considered, now how do you feel? The bigger picture for me is this: When I'm truly honest with myself, all I really want as a sportbiker is to live within a culture that understands and respects me, doesn't tread on my rights, airs the big races on cable TV to lukewarm ratings, and is more or less willing to tolerate my eccentricities so long as I ride and conduct myself within reason. The thing is, friends, should all things motorcycle continue to grow and flourish at the current rate, I fear that those rights and pleasures will be killed at the tip of the lawmaker's pen, and by the razor-sharp blade of public opinion. I don't know. Perhaps I'm just intimidated at the idea of this thing I have loved for so long becoming everybody's sport. Maybe I'm afraid it's slowly losing its uniqueness and sacredness. Whatever the reason, I can't help but fear that motorcycle popularity on a NASCAR-sized scale would be an utter disaster. I love watching Eric Bostrom win races almost as much as I love watching Mat Mladin lose them. And while those two happenings are generally co-dependent upon one another, they rarely ever happen simultaneously. So for those of us who long to behold such rare alignments within the superbike cosmology, we're always sure to have our figurative telescopes pointed toward PPIR in giddy anticipation. Just like atomic clockwork, Eric didn't disappoint last weekend (and neither did Mat). That said, Eric's ability to win consistently at PPIR is an unarguable anomaly. After all, he hasn't won a championship since 2001, nor has he been a contender for the superbike title since 2003. He and his brother Ben, for whatever reason (and I have my own speculations as to why), have both relegated themselves to also-rans amongst their factory peers over the last few seasons. Be that as it may, the riddle of Eric's prowess at PPIR is made even more perplexing by the fact that he's won at Pikes Peak once on a Honda RC45 ('98), three times on the legendary Kawasaki ZX-7RR ('00, '02, '03), and twice on his latest mount, the Austin Ducati 999 ('04, '05). Whether he's straddling a V4, I4, or V-twin, he frequently figures out a way to get it done in the shadow of the peak. Oh, and all of those bikes were arguably inferior superbike platforms at the time of those victories, I might add. Perhaps it's strong confidence and an incredibly positive mental attitude that overtakes and pushes EBoz to victory in the wilds of Colorado. Hell, maybe it's the thin air. Whatever it is, I wish Bostrom and his team could figure out a way to make it happen more often elsewhere. Until that time, I'll be looking forward to next year's race at PPIR. It's more than likely that Eric won't win again until then. A wise man once said that necessity is the mother of invention, and anyone who rides an older model race replica knows just how true that observation is. 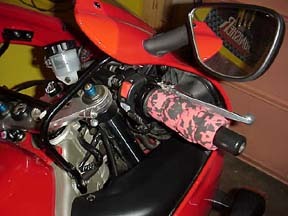 The obligatory need for customization and "comfortization" on many out-of-vogue, limited-aftermarket sportbikes can lead the men who ride them to do highly unorthodox and eccentric things. Take Usenet denizen Larry "xlax" Lovisone, for instance, whose crazed obsession with personalizing his very rare Honda RC45 drove him to personally design and fabricate everything from custom triple clamps to exhaust canisters for the now venerable HRC superbike platform. 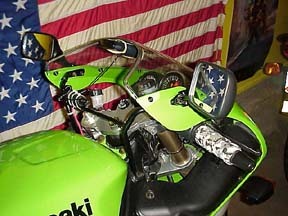 As a ZX7R owner, I'm beginning to understand Larry's pain. Ten years ago, the 750 Ninja was one of the most saught-after bikes on the planet. These days, the average pimply-faced teenager on a GSXR1000 doesn't even know what a ZX7R is. And that lack of popularity, along with the bike's obsolescence in premier racing is reflected strongly in ever-dwindling equipment choices within the aftermarket. So when I needed to make my 7R more comfy, I -- much like Larry -- was basically left to my own devices. No problem. I'm as eccentric as the next guy. So to increase the diameter of the handgrips, which I needed for both cush and to raise my riding position, I wrapped them thickly with bicycle grip tape, as shown in the photo above. Modification of the 7R's stock seat was necessary, as well. I simply removed some of the seat cushioning to give the ergonomics a more upright geometry. Notice the dip in the seat's profile. These two simple mods turned the bike from a mild torture rack into a fun motorcycle that I have easily done 300-plus mile days on. 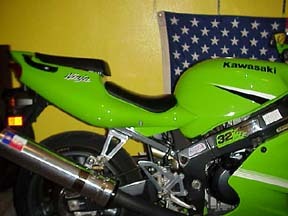 In fact, the grip tape trick worked so well that I did the same thing to my other bike, a 2000 ZX6R. I guess the moral of the story here is to not be scared of older or less popular bikes, and that solutions to your comfort woes are never impossible to overcome. Whether the answer lies in custom milling or simply making a trip to the local bicycle shop, where there's a will, there's always a way. The Mat Mladin Cup Series rolled on unabated at Infineon Raceway over the weekend, as the perpetual AMA superbike champ wrote two more wins into the record books. Mladin has won seven races so far this year. I know it begs the question at this point to ask whether or not Mladin and his Yoshimura Suzuki team are utilizing some manner of traction control on his 2005 GSXR1000, so perhaps it is more appropriate to simply wonder what kind. Mladin is not only winning races at this point, he is dominating them, performing 10- to 15-second walkaways against a field of generally paritous factory machinery. Yes, I know that many dominant racers over the decades have had to endure accusations of traction control use. I suppose it's just part of the territory to an extent. But in Mladin's case, there are more noticeable variables in the equation than with champions past. Now mind you, I'm not about to accuse Mladin's team of cheating. In fact, it is very likely that Yoshimura Suzuki is operating perfectly within the current Superbike rules, which state that a motorcycle may not implement a system whose "specific" purpose is traction control. That qualification leaves plenty of perfectly fair, albeit underhanded opportunity to utilize the technology. "While no one intimately involved will talk on the record about how traction control works in Superbike racing, it's assumed that torque curves are customized via the ignition and fuel injection maps, per gear, so that wheel spin is minimized. Having massive wheelspin in fourth gear exiting turn five at Elkhart? The torque curve is modified so that the engine won't simply overpower the tire, and will in fact hook up and drive. And therein lies the paradox of Superbike traction control: When does efficient engine mapping stop being an act of tuning for engine tractability or the best traction, and become outright traction control?" Which brings me back to my original assertion, that Mladin's bike may be exhibiting noticeable characteristics indicative of traction control use. Firstly, Mladin's bike sounds different than the other bikes on the grid, even those of his own teammates. And it's not just his cut-down exhaust canister. I first noticed the audible difference in Mladin's bike from the race paddock, but it can even be heard on television, especially as Mladin exits tight corners. To me, the Gixxer almost has the tonal quality of a bike with gear-driven cams, with hints of inline triple at lower revs. Secondly, notice that Mladin consistently destroys his rear tire at certain tracks, mainly those with banked ovals like Pikes Peak. In many of those instances, his wear rate is exponentially higher than even those of his teammates, who supposedly ride identical machines. Could it be that whatever system of traction control Mladin is allegedly utilizing becomes a liability in certain situations? Look, I know I must sound like some looney conspiracy theorist at this point, but those who share my assertion have much more than simple conjecture to go on. Every team member I talked to at the last superbike race I attended was either suspicious or convinced that Mladin is using traction control. I honestly hope I'm wrong about this issue, but I don't think I am. Regardless, history will undoubtedly judge Mladin as one of the best AMA racers ever, even if the traction control theory is one day proven. And I suppose it should. As much as I'm put off by the guy's attitude, I respect his incredible talent and dedication to his craft. Technically, this post really has nothing to do with motorcycles, but it will help to explain why I have been posting infrequently over the last few weeks. It will also offer some insight as to the potential future of the Superbike Blog. Lately, I've been feeling the strong need to make some professional changes in my life, and am currently weighing a few potential career options. In short, I'm trying to decide whether or not to go back into journalism full time, or if I want to go into business for myself as a freelance writer and illustrator/designer. It's a tough, scary process, but I've taken the first few steps. With my wife's blessing, I have given notice of resignation to my current employer and will be buttoning up loose ends there until the end of the month. After that, I plan to take a week of vacation (which will probably last about two days before I start freaking out), then get my next plan into action -- whatever it turns out to be. The main point of explaining all this personal stuff to the readers of the Superbike Blog is that, should I return to full-time journalism, this weblog will likely need to be discontinued and removed from the Internet. As a media person, it might not be appropriate to have such strong political opinions -- motorcycle-related or otherwise -- published on a personal blog. At any rate, I'll keep everyone posted as to my decisions. I know that several commercial websites whose products I have reviewed on the Superbike Blog, link to those articles as an advertizing tool. If the weblog should unfortunately be dismantled, I'll try to work out a way to keep those articles available, if at all possible. Regardless of the outcome, I offer heartfelt thanks to everyone who reads and supports the Superbike Blog.